This massive, outdoor, communal meal drew the biggest crowd in its 30-year history with 13,000 people. 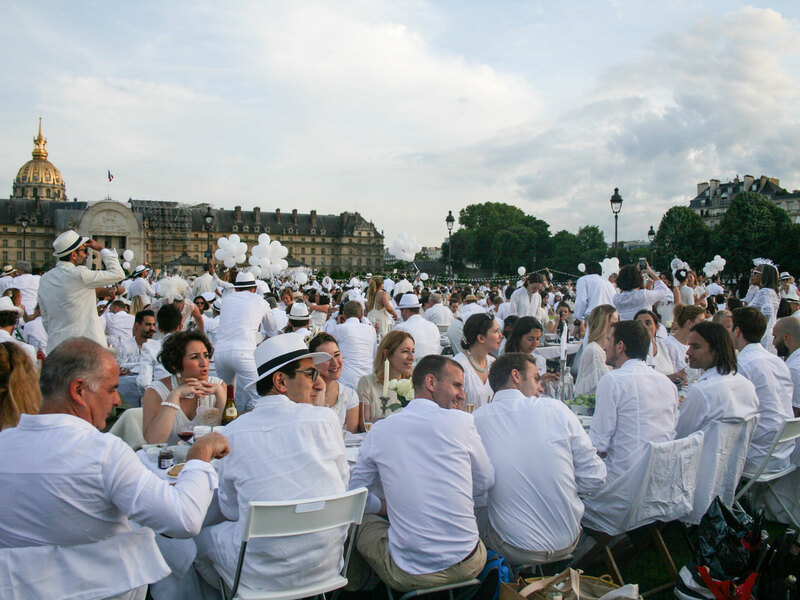 The days leading up to the 30th anniversary of Dîner en Blanc—the outdoor, all-white dinner party that takes place in a different city around the world every year—just celebrated its 30th anniversary with a feast for the ages in Paris this past weekend. were shrouded in secrecy. In the biggest turnout the pop-up has ever seen, a staggering 13,000 people attended. But like every year, the location of the dinner was kept a complete secret until it was time to eat. Would it take place under the Eiffel Tower? I wondered as I boarded the plane to Paris, knowing only that I would eventually pull up a chair to dinner somewhere. Or the Champs de Elysees? I speculated when I hit Charles de Gaulle. No one knew. I didn’t even know what we would be eating. This year, Dîner en Blanc partnered with the Sofitel hotel group to create an immersive experience for guests, and Sofitel invited me along to experience the dinner for myself. It was my second time Paris in roughly eight years. The first time I came alone, carrying only a hiking backpack and sleeping on a fold out couch belonging to a friend of a friend. This time, I would be attending a super-mysterious dinner party with a location kept so well under wraps that no one is sure where it is until they're literally standing right in front of it. Paris, it seemed, would finally be revealing it’s legendary glamour and romance to me. To attend the event, diners have to receive an invitation code or sign up for the waitlist. Invitation codes only go to people on the membership list. How one gets on said membership list remains a mystery to me. No one was able to tell me, but I do know that once you’re on the list, you’re on it for life. 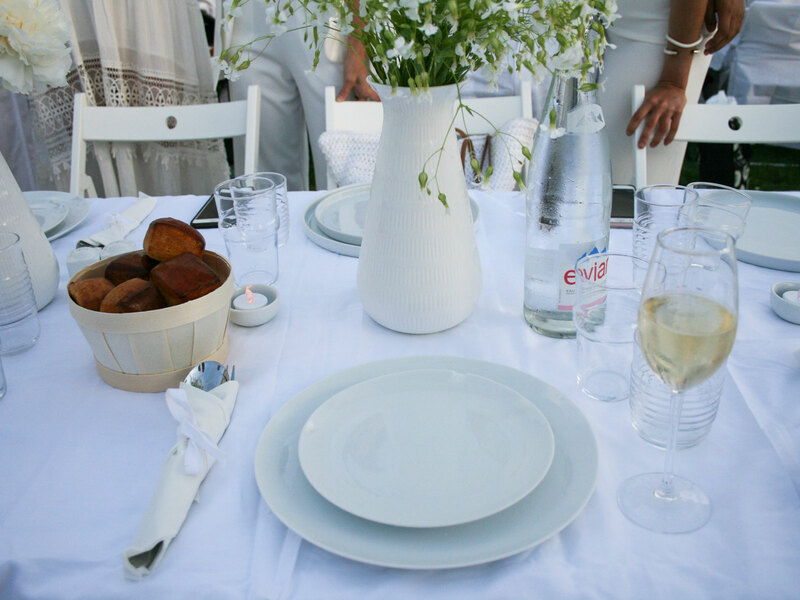 For an event that purports a level of exclusivity usually associated with A-list VIP events, Dîner en Blanc has a surprisingly egalitarian, DIY mentality. 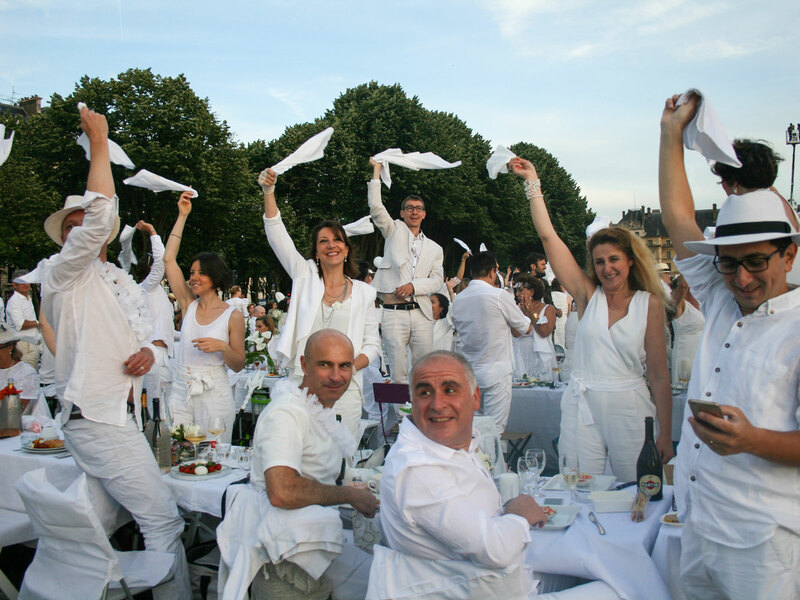 All Dîner en Blanc guests are required to bring their own tables, chairs, cutlery, dinnerware, food, and drinks to the party’s location. Sofitel worked with a catering company called Potel and Chabot to provide our four-course meal—a romaine salad, a fruit salad, a fish dish, and dessert—which they arranged neatly in white picnic baskets. The hotel also provided plates, cups, wine, and flower arrangements for the table. 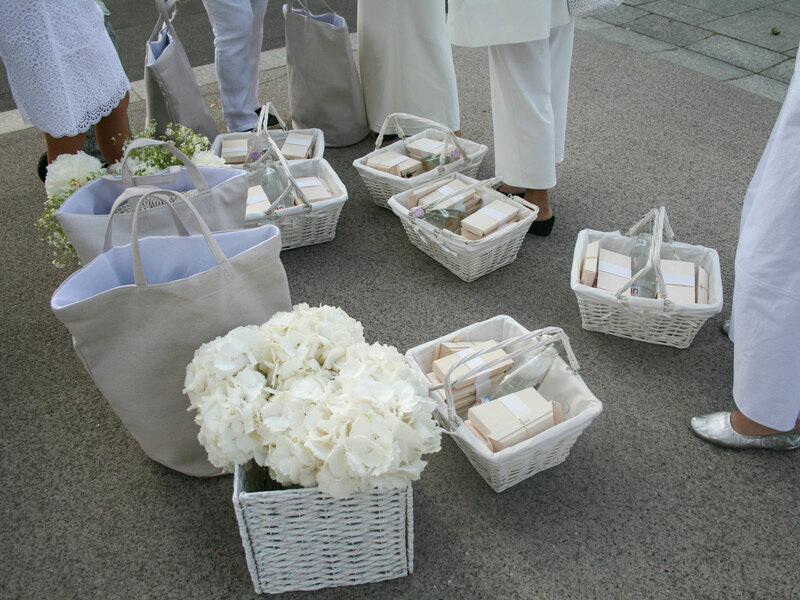 It's a Diner en Blanc package the hotel has launched worldwide, so you won’t have to worry about tracking down picnic baskets, cutlery and disposable furniture in a foreign city. This five-star treatment does have an element of manual labor though: The day of Dîner en Blanc, our group—clad in our all-white outfits and still wearing the casual walking shoes we had been advised would become indispensible—loaded the picnic baskets full of food, boxes of flowers, vases, plates, tables and chairs into the Ubers that would take us to the meeting spot: Musée de l'Armée, the home of Napolean’s gilded tomb. At that point, we still didn’t know the final location of the dinner. We lingered on the sidewalk in front of the museum for half an hour before the dinner began, watching as more crowds began to gather, all wearing white—fascinators covered in feathers popped up in the mingling groups, an older woman in a tiara appeared amid statuesque Parisian women bearing fringe and capes, and a man shouldering a giant bottle of Champagne. We were all waiting. Finally, our group leader appeared, carrying a large, white umbrella over his head. He beckoned us forth. I dutifully lifted the box of flowers I had been put in charge of and began to march down the street as the crowd around me slowly thickened to thousands of party-goers deep. The hot, Parisian sun pulsed over-head, smearing the makeup I had so diligently applied earlier, and I began to feel water from the vases slosh out of the box and onto my brand new white jeans. 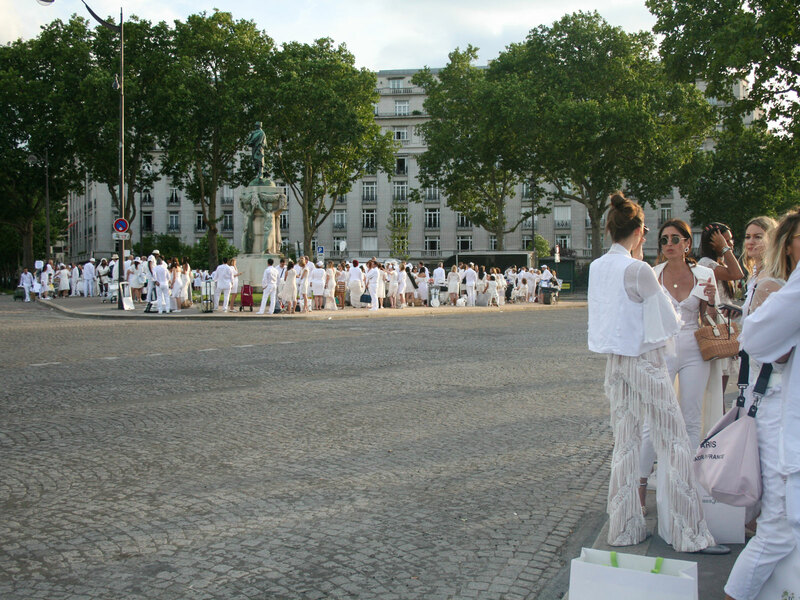 Getting to Dîner en Blanc is an endurance test, but it’s also a spectacle. To watch the sea of white descend on the streets of the city, blocking traffic, pushing carts across rocky paths, is to feel a sudden, urgent sense of community and purpose. Eventually, sweating and frizzy-haired, I set down my box of flowers on the patch of grass reserved for us in Les Invalides park just behind the military museum, with a perfect view of the Eiffel Tower. 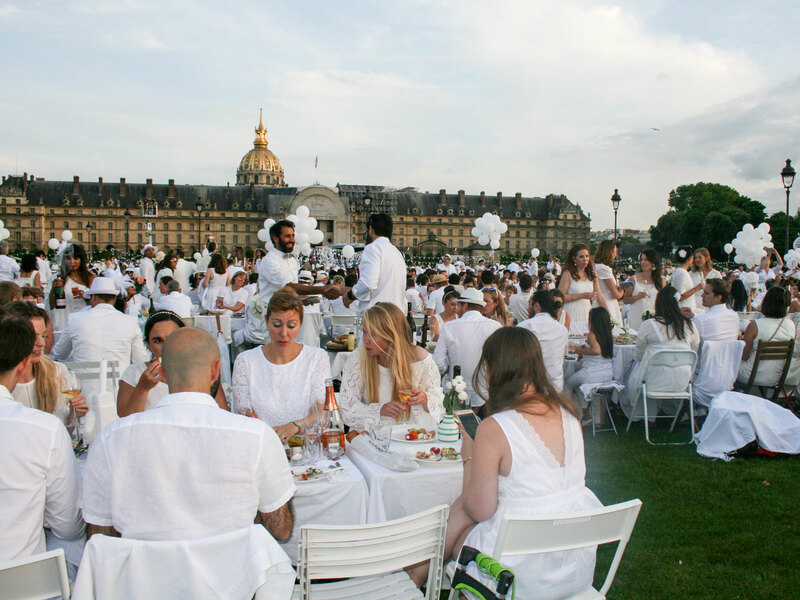 We set our table and poured ourselves Champagne, eventually settling in to watch the sunset over the Eiffel Tower, along with the 13,000 other Dîner en Blanc guests seated all around us. A DJ and a live band set up and soon two dance parties broke out on the grass. All around, I heard laughter and the clinking of glasses—an electric, happy buzz filled the air and mixed with the evening’s cool breeze. I forgot, momentarily, about the rest of the world. Eventually, needing a breath of fresh air and a moment of quiet, I stood up and walked away from the crowd to the outskirts of the park, passing a marching band, and a group of friends taking pictures of each other between lanes of traffic. On the edge of the grass, I took stock of the scene—strangers meeting each other, hugging, pouring wine for each other, older couples swing dancing, young men standing on a table popping open bottles of Champagne that they sprayed on the crowd. In the midst of all that frenetic, thrilling energy I actually experienced a moment of serenity. The magic of Paris, it became clear to me, was not the Eiffel Tower or the River Seine or the bustling coffee chops, but the spontaneity of its people, their ability to grasp a single moment in time and live in it, fully and unreservedly. By the time I got back to my group, sparklers began to materialize on the table. The air turned golden and filled with smoke. I don’t have a satisfactory picture of this moment. Someone handed me a sparkler, I kicked my shoes off, stood on a chair, and began to wave it in the air. Dîner en Blanc's partnership with Sofitel is available in Montreal, Philadelphia, Chicago, New York City, and Los Angeles, this fall.